Goldfinch Bird Feeder that they love is this Big Tall Yellow Thistle bird feeder. This Spiral Goldfinch bird feeder is a 36 in. Tall Tube bird feeder size that birds and birders can appreciate! More perch area means more birds, shown here with 15 Goldfinches. Birds love to "Run the Spiral" instead of flying to another single perch. Spiral attracts Golfinches, Red House finches and other desirable songbirds to feed at the same time. Aluminum and stainless steel parts. Squirrel proof patented locking lid just twist and lock those pesky varmints out. The tube bird feeder has Easy twist and clean top and bottom that comes completely off for easy cleaning. No screws to mess with. Easy to hang looped wire hanging cable included (150 lb test) and attached. Holds cap so you don't have to search where you put it. Manufacturer offers lifetime warranty on workmanship and normal wear and tear. Hang in your yard, and watch how fast the birds are attracted to the patented Spiral Perch. 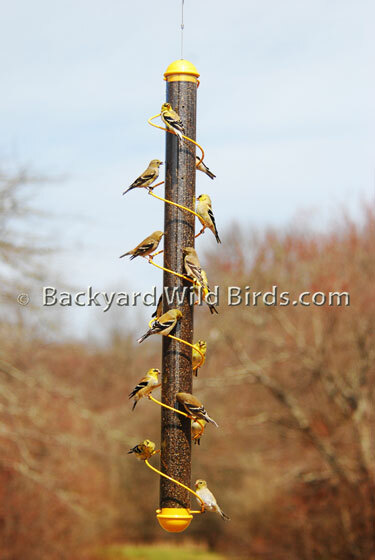 Just make sure you have enough room for this 36" tall bird feeder and get ready to watch all of those Goldfinches.